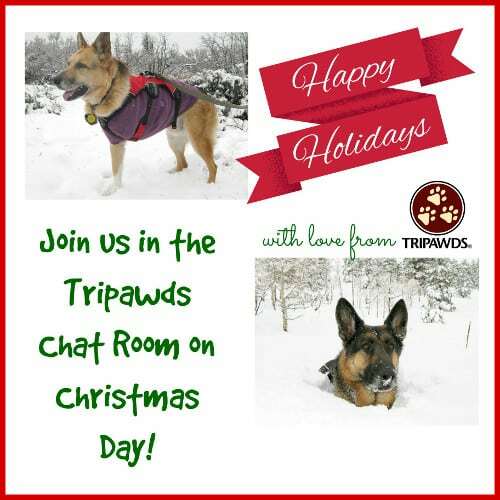 Let’s all get together in the Tripawds Chat Room for the annual Tripawds Community Christmas Day Chat Pawty! We, along with Wyatt Ray, will be stopping in throughout the day (we’re on Pacific Time right now, so we won’t be there too early), and hope to see you there. It’s been an amazing year in this community and we’d love to give you a big ol paw-wave in the chat! 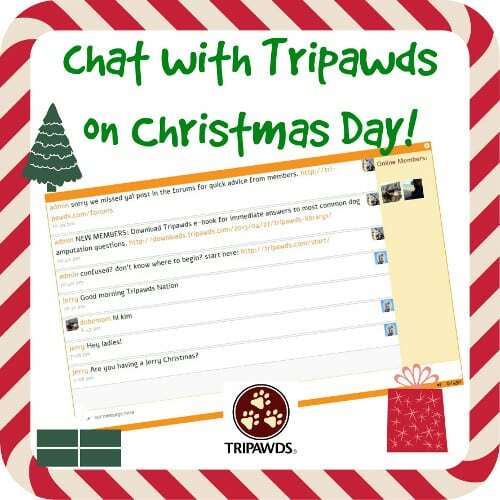 Just log in and step into the Tripawds Chat Room. Bark and make sure your volume is turned up so if someone stops by you know they’re there! Have a beautiful howliday with your packs and know that you are in our hearts now and always. Have a Very Jerry Christmas! BEAUTIFUL CHRISTMAS CARD!! And BEST CHRISTMAS VIDEO EVER!!!! EVVVVVEEEERRRRR!! I could watch this a thousand times and each time fall in love with yet another little nuance of sweet Jerry! He was absolutely gleefully determined to rip his “presents” to shreds! He did it masterfully too!! To be so exhausted from joy, what a great kind of tired!! His greatest gift was being loved every second of every day by you two. Never doubt that. Wishing you a VERY JERRY CHRISTMAS! Sally and My Eternal Light Happy Hannah and Merry Myrtle and Frankie too!